Regardless of what level you coach there are many ways to make beam exciting. 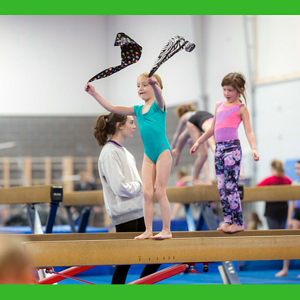 Gymnastics classes for kids include vault, bars, floor, and of course, beam! Beam is a great event to add props. play games, and provide challenges. Beam requires repetition in order to create consistency and confidence. 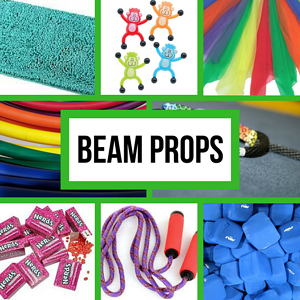 Explore these ideas to help make beam an event that your athletes look forward to! Walk - Walk as many different ways as you can: fast, slow, forward, side, backwards, on your heels, on your toes. Bear walk - What a great way to practice getting inverted on the beam. It is one of the best lead ups for handstands. Don't forget to go forward and backward. Handstand walking - Walking on your hands is challenging on the floor, not to mention the beam. The goals are to build arm strength, become come comfortable being in a vertical handstand, and learn to control your handstand and shift your weight. Run - Run forward, run backward, try running with high knees, or quick feet. This will be scary at first, but with practice it soon becomes fun. Skip - Start with marching, progress to step hop freeze, then to skipping, and last to high skips. This is a great drill for leaping. Bunny hops - Hop in all directions forward, side, back, hop on one foot, hop and switch feet. Just get hopping. Hopping will help improve jumps and tumbling on the beam. Jumps - Jumps take lots of practice. Try jumping for distance. Try jumping as high as you can. Try jumping in a pattern (ie: long jump, tall jump, long jump, tall jump...). Hula hoop - Hula hooping on the beam helps the gymnast learn how to save a landing. They have to keep their feet glued to the beam while twisting their hips to stay centered. For an extra challenge, have your gymnast hula hoop with their feet in different positions (lunge, lock, arabesque). Foam roller - Have gymnasts work on their balance by lunging on top of a foam roller on the floor (NOT ON THE BEAM). As the roller moves from side to side gymnasts will work on finding their center of gravity and strengthening the core. Wobble spot - Use the wobble spot much like the foam roller. You can also practice different positions on the wobble spot. Close your eyes (for stationary work) - Work on balancing with closed eyes. This is definitely a challenge and requires a lot of focus. This should only be done with static holds. Act it out - Move like different characters. The week of Halloween, move across the beam like a witch, black cat, or zombie. Trying walking like Santa, a reindeer, or an elf. This is always a favorite and a chance to see how creative your athletes are. Create a phrase - A phrase is a string of movements. Start simple by giving two or three movements for your gymnasts to exemplify. For example, float and glide. You can keep building and adding more creativity. For a challenge try creating this phrase: sharp, quick, punch, freeze, melt. Move to the music - Try adding music to your beam warm up. Walk to the music. Add arms to match the music. Dance across the beam. Switch places on the beam - Line your gymnasts up on the beam and challenge them to switch the order of their line without anyone touching the floor. If anyone touches the floor everyone goes back to their original spot to try again. Pass the hoop from person to person - Stand your gymnasts on a beam. Have them all hold hands. Start the hula hoop with the person at one end and have it travel down and back. Gymnasts must keep holding hands and complete the challenge without a fall. This game is better on a lower beam, since they are holding hands, if one falls, they often all fall. Play catch - Stand in the position of your choice on the beam and play catch with a partner. Play catch in passe or in an arabesque. Bonus, this is great for ankle strengthening. Have an on and off contest – How many times can you mount and dismount in 1 minute? What a great way to get new athletes acclimated to safely getting on and off the beam. It is also great for competitive gymnasts who need to work the mount and dismount. Create a mission or a beam maze - Give your group a mission to get everyone from one side of the beam area to the other without touching the floor. Add mats or blocks between the beams to link the beams. They can simply walk through the maze to complete the mission or they can be assigned a skill to make on each beam to complete the mission. If at any point their feet touch the floor they get to return to the beginning to try again. Beam is scary for three reasons: 1. It is hard. 2. It is high. 3. It is skinny. If you can break down these pieces so gymnasts are only work with 1 or 2 of the challenges beam becomes more fun. Change the height - Have low, medium, and high beams available. Change the width - Use a laser beam or 5" low beam to increase the width. Add a beam pad - Apply a beam pad to soften the beam or to widen the beam. Be careful not to let it become a crutch. Use a soft beam - A foam beam is awesome for learning new skills. It takes away the fear of hitting the beam and getting a beam burn or bruise. Use a spot block - Have the gymnast perform the skill on a spot block. It allows them to get the feeling of doing the skill up high without having to worry about the width. Stack the mats - Place 8" mats under the beam and slowly remove them as the gymnast is ready. Use a line - Perform the skill on a line to check that it is ready for a beam. Use negative space - Perform the skill in between two panel mats. This is a great way to get the gymnasts to put their hands together for handstands, back walkover, or back handsprings. dd as many beams as you would like, just make sure that each step is a little more challenging than the next. Work ahead - Work upgrades on the line and low beam a year or two prior needing them on a high beam. Change the start position - Have your gymnast start their skills from their knees instead of a lunge or kick. Change the end position - Finish skills in a variety of positions (lock, lunge, on one foot, on your knee). Change the speed - Try finishing a skill as slowly as you can, orsee if you can perform a 5 second back walkover. Add a connection - Keep your athlete moving. If they can do a great cartwheel add a straight jump or a split jump. Perform skills ending off the beam- Start the skill on the beam and finish the skill on a mat at the end of the beam. Perform skills starting off the beam - Start the skill on the mat and finish the skill on the beam. Perform skills uphill - Practice the skill up to a panel mat. This builds confidence when a gymnast knows they can do the skill uphill they feel more comfortable performing it level. Stamp their feet - Use ink to stamp your gymnast's foot. 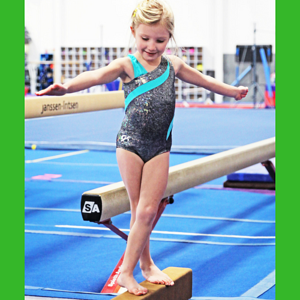 Remind them to look at their foot when they land their skills on the beam. Donkey kicks - Work straight arms and correct hand placement by having your gymnast stand in a pike with their hands on the beam and hop their feet up and down. Partner HS hold - Have one gymnast kick up to a handstand and the other hold their ankles. Keep in mind this is an advanced exercise and the gymnast needs a good handstand prior to attempting this drill. Practice falling from a handstand - Knowing how to fall from a handstand decreases fear. Teach your gymnast how to turn to the side of the beam when needed. Skill to the wall - Perform a skill to stop with one skill on the wall to check for alignment. Turns, back walkovers, back handsprings, and handstands are great skill to check alignment. Use a rubber ducky - Place a rubber duck at the ends of the beam. Encourage gymnasts to look at it. Teaching your gymnast to see the beam is very important. Balance beam is an event of detail. For some athletes this detail can become boring, adding props to increase the gymnasts' awareness of hands, arms, and proper position help make the details more exciting. Hula Hoops (for arms) - Have your gymnast hold the hoop in between their thumb and first finger to reinforce strong arms and pretty fingers. Jump Ropes - Jump roping on the beam increases coordination as well as decreasing fear. Jump roping is a great way to work on strengthening the feet for jumps. Rugs - Add a bath rug to jump over, leap over, reach over, or lunge over. Foam blocks - Hold a foam block with your forearms to help gymnasts keep their arms by their ears in levers, handstands, and cartwheels. Nerds - Teach pretty fingers by asking the gymnast to hold a box of nerds with their thumb and middle finger. Scarves - Scarves are great for reinforcing arm positions. Have the gymnasts hold a scarf in each hand while working on their jumps. Practice moving the arms up in front and then dropping them to the side. Jelly toys - Use jelly sharks or monkeys to reinforce either pushing into the beam or keeping the heel off the beam. Gymnasts can smash the jelly toy into the beam or try to turn above the jelly and keep their heels off the shark. Style ropes- The style rope is a great tool for working on presentation. The style rope helps the gymnast feel proper arm position, hand position, and posture. There are many style rope workouts for beam and floor. Consistency comes from successfully completing a skill. The tricky part is that success is defined differently at different stages of the learning process. A successful turn when first learning a skill might mean trying it on a new beam and considering it a success even if they don't stay on the beam. While later, when the gymnast becomes more proficient and confident a successful turn might only be counted if they make the skill . Count as a group - Set a goal as a group and have the gymnasts count as a group when they make a skill. Increase the number each week to keep your group challenged. For example, this week's challenge is to make 50 cartwheels in 3 minutes. Use dice - Roll the die to determine how many repetitions your gymnast should attempt or make. Or have your gymnast roll the die to determine how many seconds to hold a static pose. 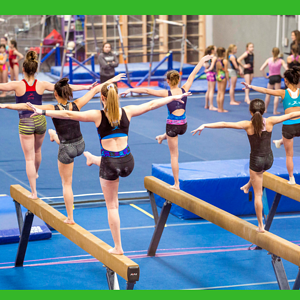 Perform skills in a row as a group - Have each gymnast take a turn at a skill. Challenge the group to see how many they can do in a row. Make sure that the gymnasts are being encouraging of each gymnast performing the skill. This is a great way to add practice under pressure. Skill of the day - Choose a gymnast to perform a skill of the day. Choose a gymnast who has been working hard at the skill and can perform it well. Have that gymnast show off their skill while the rest of the group watches. Set a timer – See how long your group can go without a fall, or how long it takes to do a set number of skills. Finish a puzzle - Have each gymnast add a piece to a puzzle each time they complete a skill. This activity works best with younger kids who can do board puzzles and not have to wait on the next piece. Add on straight jumps – Gymnasts can work with a partner, as an individual, or as a whole group the challenge is to see how many straight jumps can be done in a row. Gymnast 1 does 1 straight jump, gymnast 2 does 2, then gymnast one does 3, and gymnast 2 does 4 and on and on. If a gymnast falls the group or partners start back at 0. Make a flowchart assignment - Create an assignment with multiple paths. If a routine is made the gymnast follows one path and if it is not they follow another. 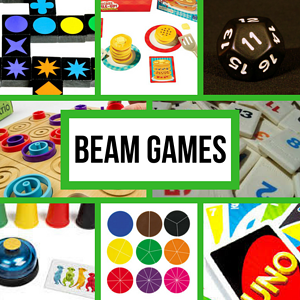 The use of games can make the beam rotation very exciting and fun. Games often encourage the gymnast to take more turns. They also can provide pressure situations as well as creating a positive team atmosphere with the athletes cheering each other on. The good news is, almost any game can be modified for the balance beam. 61. Uno - Give a gymnast or group of gymnasts a set number of uno cards. Each color represents a skill the gymnast needs to perform and the number tells the gymnast how many repetitions. Once they have completed the reps they can discard. The first person to discard all cards wins. Cards - Similar to Uno each suit represents a skill and the numbers represent the repetitions. However, if a gymnast draws a queen, they become the beam queen, the entire groups stops and watches that gymnast perform the skill. Jeopardy - Download an editable version of the game Jeopardy on power point. Make each category a different beam category: turns, leaps, jumps, acro, etc. Candyland - Create a Candyland board. Each spot on the board has different skills or drills. Make sure to include some fun spots as well. Sing a song in a lunge is always a hit. Gobblers for a more challenging version of tic tac toe. Bingo - Create a beam bingo card with the skills your gymnasts are working. Challenge gymnasts to be the first to bingo or better yet, black out. Connect Four - Divide your group into teams to play connect four. For every made routine or 5 made skills add the team gets to play a piece. PIG - Just like the basketball game, one gymnast does a "trick" the other gymnast must do the same "trick." If the first gymnast misses and the second make the first gymnast gets the letter P. The first to spell the word looses. Try using the word balance or beam for more rounds. Trivial pursuit - Each gymnast gets an empty trivial pursuit pie. The goal is to fill the pie with one piece of each color. The dot game - Gymnasts add a line to the dot time each time the make a routine or set number of skills. Gymnasts can play with a partner or with the whole team. Pretend Money - Give different skills different beams different monetary values. For example, low beam = $1, medium beam =$5 dollars, high beam with mats = $10 dollars, and high beam without mats =$25. Gymnasts earn money buy making skills on different beams. Builders and Destroyers – Divide your group into two teams. Start with towers (the number of towers = the number of people) of two or three foam blocks. The destroyer team removes a block from a tower every time they make a skill and the builder team adds a block to a tower with each make. When there are no towers left standing switch teams. Cup Stack - Divide into teams. Each team tries to be the first to complete the cupstack. Cups must be stacked in order after completing the skills for that color. The first team to finish rings the bell and gets the point. Pancake Pile Up - Much like cup stack, each pancake represents a skill and the race is to be the first to complete the order. Memory - Every made routine is a chance for the gymnast to flip over two cards. The winner is the person with the most matches at the end. Clear the Board - Using fraction magnets, gymnasts try to get as many pieces as the circle as they can. The person who can make the most circles at the end wins. Gymnasts play until all the fraction pieces have been claimed. Qwirkle - Gymnasts make a skill or routine to draw a piece. At the end they are able to play the game with the pieces they have earned. Rumi kub - Much like qwirkle, pieces are earned by makes and the game is played at the end. Younger gymnasts can earn a tile with each make and simply add them up at the end to determine the winner. You can also draw a tile and perform that many skills. When it comes time to learning and perfecting the routine gymnasts need to have ways to practice that keep them engaged and excited. Teaching the gymnast to break the routine into parts can help with memorization and can create success early in the season. Toward the end of the season gymnasts will need to be challenged with routines a row or routines with additional skills. 79. Play build a routine - Starting with the mount the gymnast build on one skill each time they go until making it to the dismount. 80. Routine of the day - At the conclusion of the workout, the coach selects one gymnast to show their routine to the other gymnasts. This provides a chance to perform in front of a crowd and recognize someone who was working hard. Use picture cards - Create picture cards of the poses in the compulsory routines and have the gymnasts try to mimic the cards. Make a routine puzzle - Make a copy of the routine from the compulsory routine book. Cut the pictures into pieces and have the gymnasts put the routine together in the right order to aid with memorization and to allow the gymnasts to see the correct form in the pictures. Move to the metronome - Have gymnasts perform their routine with a metronome. The metronome should help keep the gymnast keep good rhythm throughout. Dance through - Have gymnasts do their routines with the choreography no skills. Dance routine - Have gymnast do their routines with the choreography and dance skills only. Skill Set - Have gymnasts do only the skills in their routine (dance and acro) in the order they occur. Back to back routine - Gymnasts mount the beam and do their routine up to the dismount, when they reach the point they would dismount they stay on the beam and start back at the beginning completely an entire second routine. At the conclusion, the gymnast will have done all skills except for the mount and dismount two times. This is a very challenging task. Arm routine in a lock - Ask the gymnast to stand on the beam with their feet in a lock position and do the arm movements of the routine. Routine in your mind - The gymnast will close their eyes and visualize themselves doing the routine. Perform a no arm routine - The gymnast does the entire routine (no tumbling) with their hands on their hips. The goal is to focus on footwork. Routine in parts (using multiple beams) - The routine is broken into as many parts as there are beams. Part 1 is performed on beam 1, part 2 beam 2, etc. Routines for points – Gymnasts are trying to earn a set number of points (100 is common). Different parts of the routine are worth different point values. Typically, the first routine is worth double since that is the routine the judge sees. Gymnasts enjoy keep track of points on a white board. Beam knock out – Gymnasts are divided into two lines. The first person in each line battles the other. The best routine goes to the next round and the other routine is out. The game continues until you have a beam champion for the day. Double skill routines - Gymnasts perform their routine with two of each skill. Routines with upgrades - Gymnasts do their current routine with harder dance or acro skills. First half and last half - Gymnasts perform half of their routine. This is a great way to start routines at the beginning of the season. Partner routine - Gymnast one does the first half of their routine and gymnast two the second half. If they both make it counts as a routine. The next turn, gymnast two does the first half and gymnast one the second half. .5 or less - The gymnast does their routine and the coach counts deductions when the reach .5 in deduction they stop and work on their corrections until it is their turn again. The goal is to make it all the way through the routine by the end of the workout. Cold set - Gymnasts warm up on the floor and then perform a routine on the beam without warming up on the beam. 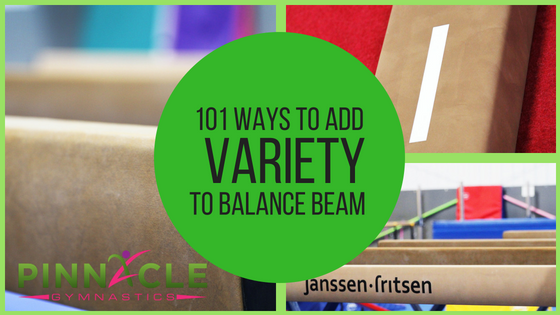 These are just a few of the ways to add variety to beam. Be creative with your beam workouts. Remember, your attitude as a beam coach will play a large impact on your athletes. Stay enthusiastic, confident, and positive.